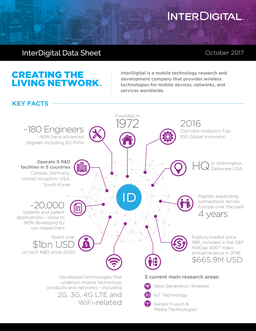 InterDigital Data Sheet KEY FACTS Founded in 1972 in Wilmington, Delaware USA Operate 9 R&D facilities in 5 countries Canada, Germany, United Kingdom, USA, South Korea 3 current main research areas: Next Generation Wireless IoT Technology Sensor Fusion & Media Technologies Spent over $1bn USD on tech R&D since 2000 ~20,000 patents and patent applications – close to 90% developed by our researchers Rapidly expanding connections across Europe over the past 4 years ~180 Engineers ~80% have advanced degrees including 60 PhDs HQ InterDigital is a mobile technology research and development company that provides wireless technologies for mobile devices, networks, and services worldwide. Publicly-traded since 1981, included in the S&P MidCap 400® index; annual revenue in 2016: $665.9M USD Developed technologies that underpin mobile technology products and networks – including 2G, 3G, 4G LTE and WiFi-related 2016 Clarivate Analytics Top 100 Global Innovator October 2017 InterDigital, Inc. | 200 Bellevue Parkway, Suite 300, Wilmington, DE 19809 +1 (302) 281-3600 | www.interdigital.com Track Record of Leadership in Technologies & Key Standards Organizations Recent leadership positions: 2001 2017 Vice Chair 3GPP RAN2 2013-2017 Vice Chair 3GPP RAN3 2001-2009 OMA Board of Directors/ Board Officer 2013-2015 Board of Directors Small Cell Forum 2009-2010 ETSI RRS Architecture WG Chair 2012-2014 IETF Internet Area WG Co-Chair (2013-present) 802 OmniRAN EC SG Vice-Chair (2012-present) 802.21 TGb Chair (2010-2012) 802.21 WG Vice-Chair (2010-2012) 802.11 TGai Passive Scanning Ad Hoc Chair (2012-2013) 802.11 ARC Vice-Chair (2013 – present) • 3G: InterDigital accounted for close to 10% of the patents and patent applications judged likely to be essential to WCDMA – the third-highest share out of more than 40 companies (May 2015) • 4G: InterDigital accounted for close to 10% of the patents and patent applications judged likely to be essential to LTE - fourth-highest share of nearly 100 companies (September 2016) • IoT: InterDigital in top 10 of global companies in terms of IoT patent landscape, ahead of Microsoft and IBM • Fourth in “high-strength IoT patents” ahead of Intel and Ericsson (May 2016) Where We Play in the IoT Ecosystem IoT Connectivity and IoT SW & Services Data Management Services/Analytics/ Middleware Enabling Technology (Focus of Chordant, an InterDigital Business) Connectivity Technology (InterDigital Wireless Business’ focus) ANALYTICS and APPLICATION NETWORK and CLOUD MANAGEMENT DATA and DEVICE MANAGEMENT DEVICES and ROUTERS 30 billion connected devices expected by 2020 (IHS, Q2 2016) Middleware & data mgmt., network & cloud mgmt. are projected to be $3B to $8B IoT markets by 2021 (Berg Insight, Aug. 2016) InterDigital has won or been shortlisted for more than ten prestigious global IoT awards including: 2015 ABI Research Hot Tech Innovator 2016 Global IoT Platform Competitive Strategy Innovation & Leadership 2015 IoT Nexus Power Players and Innovators Best IoT Product at ARM TechCon 2014 2016 MarketsandMarkets Key Innovator Shortlist - 2016 World Communication Awards TV and Remotes Augmented and Virtual Reality Robotics 190 million Smart TV and OTT devices with an additional 170 million Pay TV set-tops forecasted for 2018 $8 billion AR and VR hardware market in 2018 growing from only $109 million in 2015 $8 billion Robot Cleaner, Drone and Service Robot market in 2018 growing at a CAGR of 17% from 2015 Delivering components and license software and IP to enable our customers to deliver high quality products to market Sensor/OS Technology For Consumer Electronics and IoT wot.ioTM oneMPOWERTM Data Management Services/Analytics/Middleware Enabling Technology (InterDigital IoT Solutions’ focus) Connectivity Technology (InterDigital Wireless Business’ focus) ANALYTICS and APPLICATION NETWORK and CLOUD MANAGEMENT DATA and DEVICE MANAGEMENT DEVICES and ROUTERS 30 billion connected devices expected by 2020 (IHS, Q2 2016) Middleware & data mgmt., network & cloud mgmt. are projected to be $3B to $8B IoT markets by 2021 (Berg Insight, Aug. 2016) InterDigital has won or been shortlisted for more than ten prestigious global IoT awards 2015 ABI Research Hot Tech Innovator 2016 Global IoT Platform Competitive Strategy Innovation & Leadership 2015 IoT Nexus Power Players and Innovators Best IoT Product at ARM TechCon 2014 2016 MarketsandMarkets Key Innovator Shortlist - 2016 World Communication Awards Augmented and Virtual Reality Robotics AR/VR market to grow to $30 billion in 2021, vs. only $82 million in 2016. * Consumer robotics segment to grow at 16% CAGR to more than $10 billion in 2021. * * Reference: ABI Research, Q1 2017 InterDigital is a registered trademark of InterDigital, Inc. Chordant and Creating the Living Network are trademarks of InterDigital.